In this post I’m adding even more sample pages from my scrapbook, the previous postings of which can be found here and there. There is only one copy of the scrapbook so I like to think of it as another constructed artist book of mine. It contains images of other people’s work that I admire along with some assorted memorabilia of my own. These are images that I have collected and arranged and like to have around. Japanese anime magazine with emphasis on profiling new work. One of the first Japanese words I learned from hearing it so often on TV was atarashi, new. Lex Luthor discovers his artistic side and has fun with paint. Mixed Bag, from Nara and Mizuki to Van Gogh. I like the idea of using notebooks as well as some of the forgotten images you can find in them. Baseball cover for Peanuts collection with Schulz’s wonderful ink-line representation of grass. Sports page-Formula One and Football. San Francisco, sand and sea-the postcard is Californian but the beach is Australian. Manga Bat Wing and monster on painted sea page.The comics panel is from a Japanese version of Batman. Eisenstein with cats and dog and mouse-Krazy, Mickey and Norakuro. 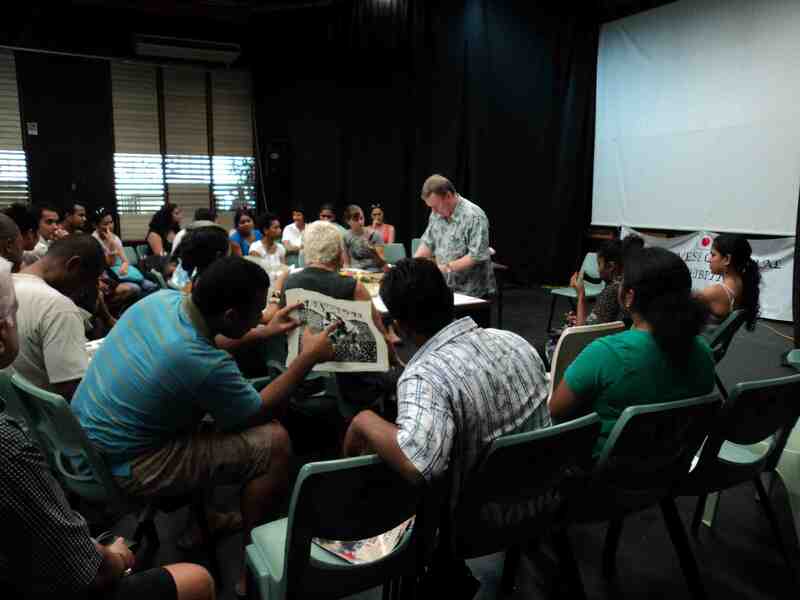 In late October I spent a week in Fiji for the Japanese Embassy and the Japan Foundation to present a lecture and workshop at the School of Arts, Language and Media of the University of the South Pacific and introduce films at an Anime festival. It was all part of Japan Culture Week 2011 in Suva, the capital city on the largest of the 300 islands and it seemed a bit like an act of cultural colonisation, raising the Anime flag and flying its colours on Treasure Island, creating a little Anime paradise in the Pacific Ocean. My lecture Up In The Air: Anime’s Journey To The Stars described the global success of Japanese animation and its rise to prominance in the film world and in popular culture. It covered the work of Osamu Tezuka and the success of his work abroad. 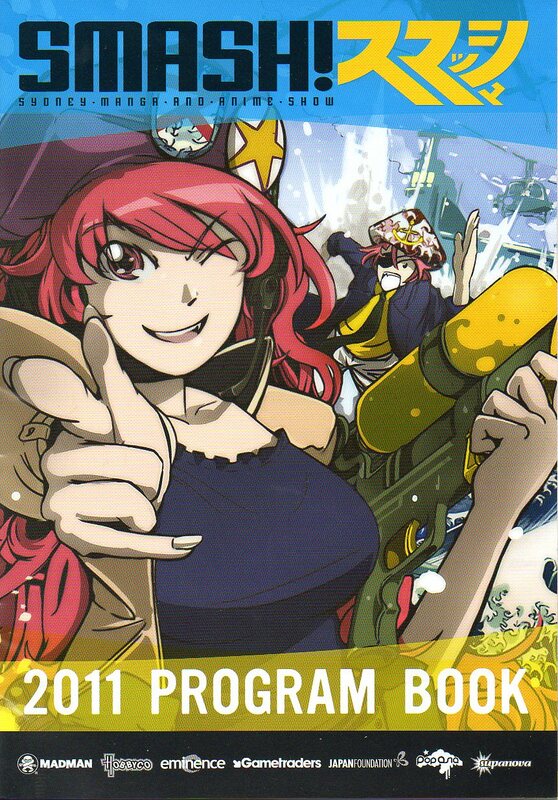 It also referred to Rintaro’s involvement with him as an animation director on Astro Boy prior to his subsequent productions that included his Tezuka homage film Metropolis, his adaption of Leiji Matsumoto’s manga Galaxy Express 999, and of Sanpei Shirato’s manga The Dagger of Kamui. Describing Shirato’s beginnings as a kamishibai artist before moving to manga and the alternative publication GARO the lecture was situated in the context of anecdotes from my time as a lecturer at an Arts college and a School of Design in Sydney where I observed the growing interest of students in Japanese popular culture. 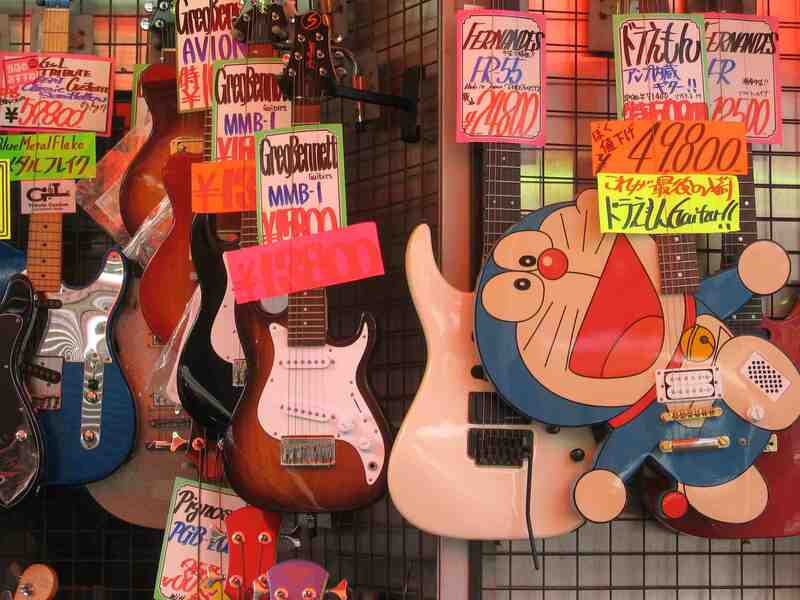 They became fascinated with manga, Anime, cosplay, J-Pop, scanlations, computer games, cameras, turntables, TV game shows, food and fashion, not to mention the learning of the Japanese language and the odd visit to Tokyo. 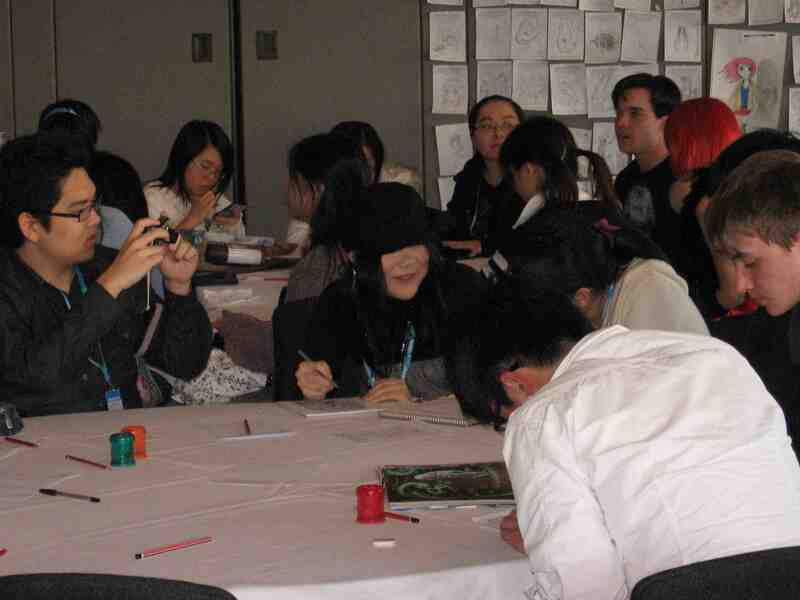 The lecture concluded with an analysis of the productions and rise to prominence of Hayao Miyazaki and Studio Ghibli who, like Tezuka, found an international audience and critical acclaim. 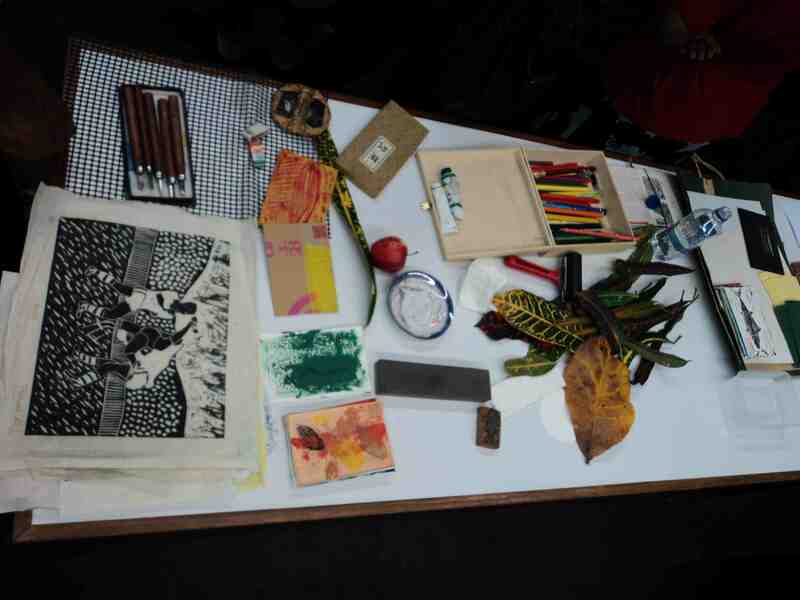 In addition to the theory lecture I also presented a practical workshop demonstrating the printmaking technique I have developed as part of my artistic practice. Based on the Japanese creative print movement of Sosaku Hanga and the work of Koshiro Onchi and Shiko Munakata in particular I showed examples of my work that have been made following this approach and methodology and applied to prints, postcards, T-shirts and comics. After the demonstration the students then made their own prints. 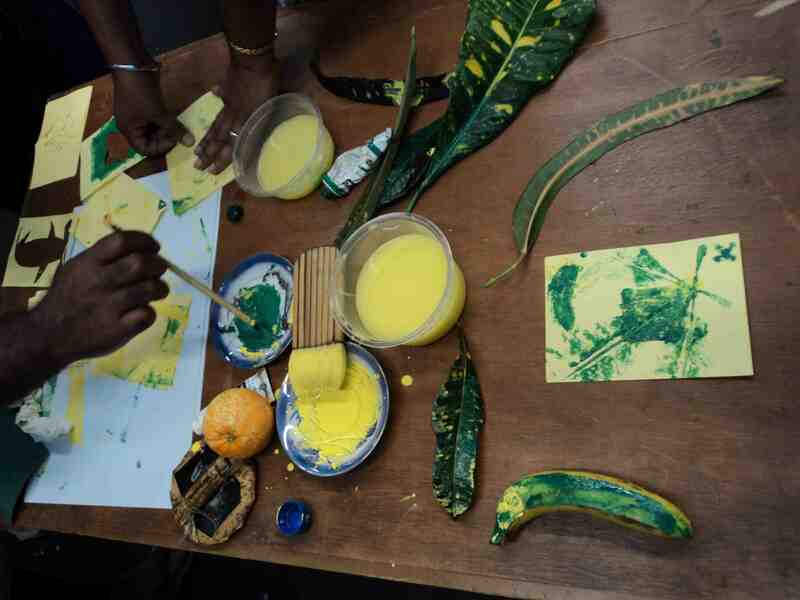 By chance, the cultural activities took place in the same week as the Rugby World Cup finals and the only paint colours to hand were those of the Wallabies, yellow and green. My own rugby woodblock print (on the table and being passed around the class, in the photos above) provided some amusement and interest. 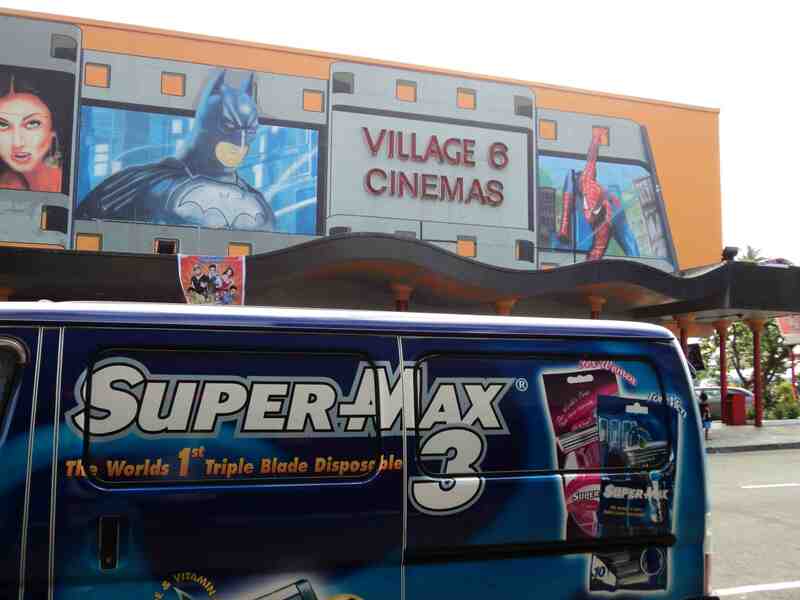 On the roof of the Village Cinema complex Batman and Spiderman look down intrigued at the sight of people going in to see the Ninja super hero Kamui. 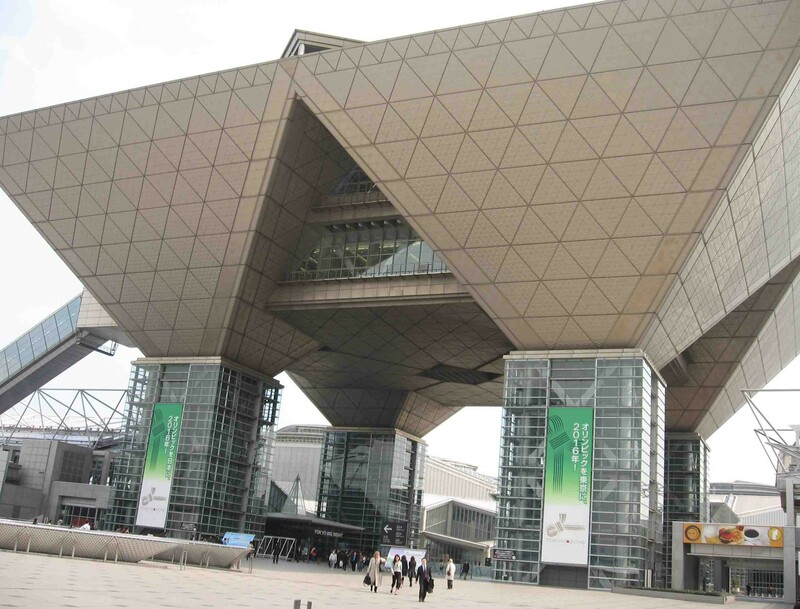 It was here that the Anime Film Festival was held each evening. 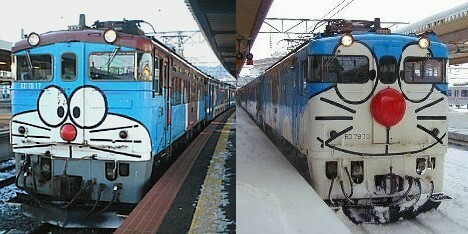 The films Galaxy Express 999, The Dagger of Kamui, Laputa: Castle in the Sky and The Girl Who Leapt Through Time were screened to impressed audiences. Anime is now a fixed part of the Japanese cultural coat of arms, emblamatic of the country’s long history of graphic arts that feeds into and nurtures both Anime and manga. A week long festival of Anime films and supporting contextual cultural events signaled an alternative offering to Hollywood and the further spread of Japanese popular culture in the South Pacific. 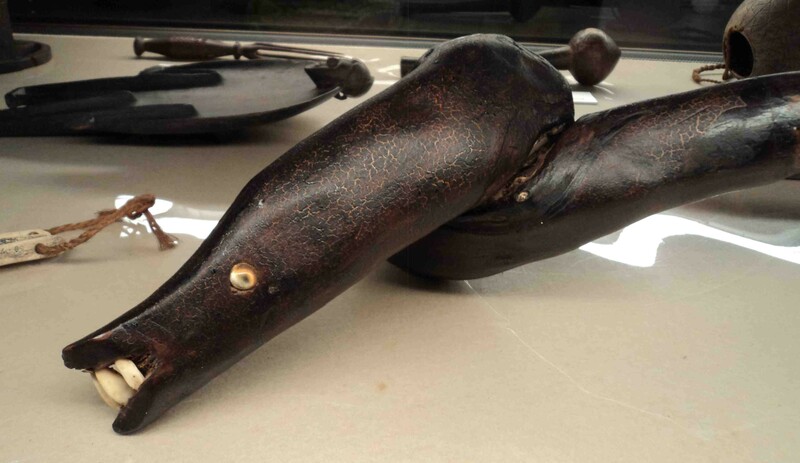 In addition to my affinity with the octopus and various fish I am partial to the eel. 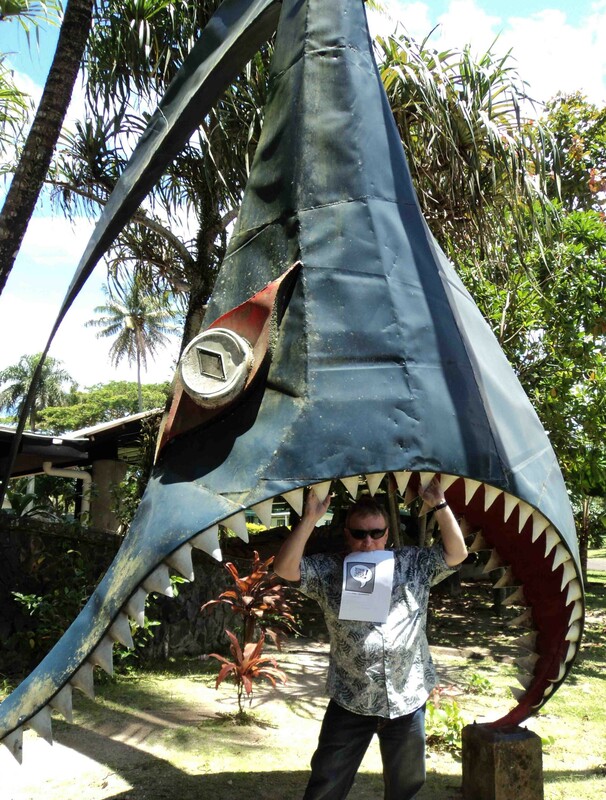 During my Fiji visit I was pleased to find that the eel has acquired the status of a deity and a creative one at that in Melanesian mythology. Below is an artwork I created based on the freshwater eels that used to be found and fished in the Parramatta River near Blacktown in Sydney. 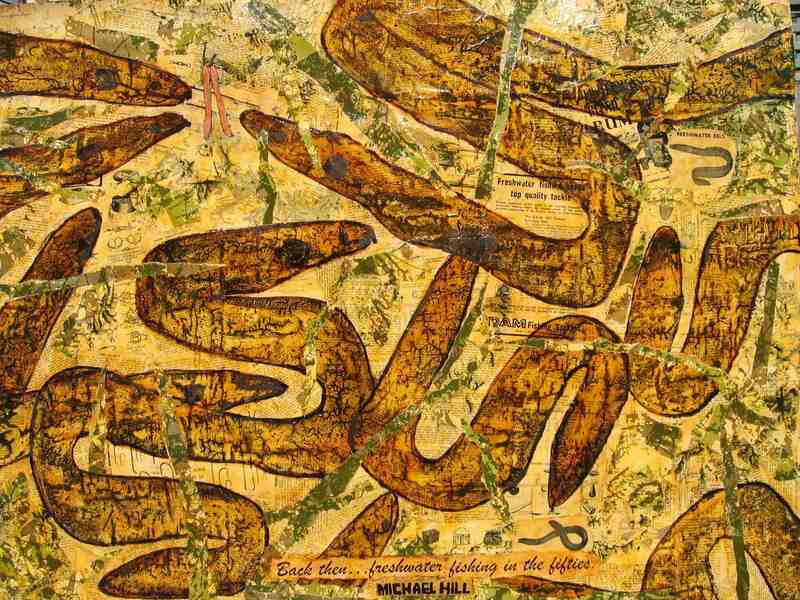 My own eel art work(print, painting and collage-© 2009 Michael Hill). 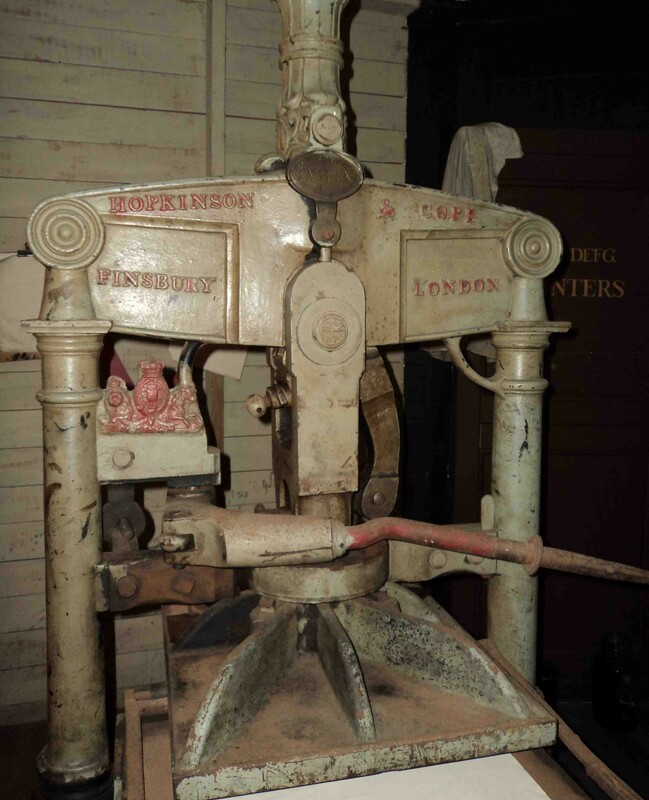 Another treasure inside the Fiji Museum was this old metal Hopkinson & Cope printing press, imported from England in earlier days. At my printmaking workshop in Suva I demonstrated a Japanese method that employs one’s body weight as a press rather than a device such as this European device. 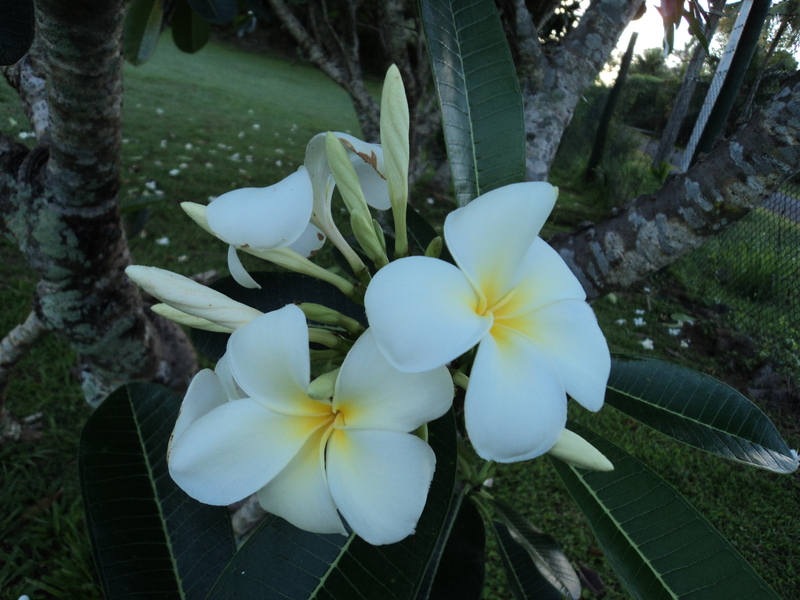 On this Treasure Island, apart from the art and the marine life, there were collections of coconuts, palm trees and flowers including red hibiscus and white frangipani, all over the place. Many thanks to Sayuri Tokuman and Susan Yamaguchi of the Japanese Studies & Intellectual Exchange Department and Tokiko Kiyota, Director of the Japan Foundation in Sydney, and to Nobuko Iwatani, Mako Nakauchi and Mele of the Embassy of Japan in Fiji, and His Excellency Yutaka Yoshizawa, Ambassador of Japan, for their ideas, assistance and support with this project. In this series I shall be featuring mini-profiles of cat characters I have enjoyed in comics. Each post will feature an image and short description of the character. 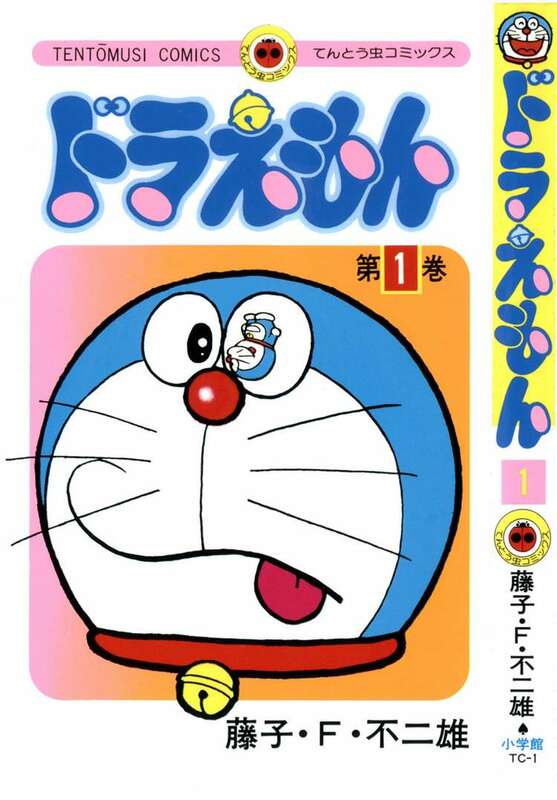 Cover of Doraemon manga issue 1. See who is front and centre on this Anime character post card! 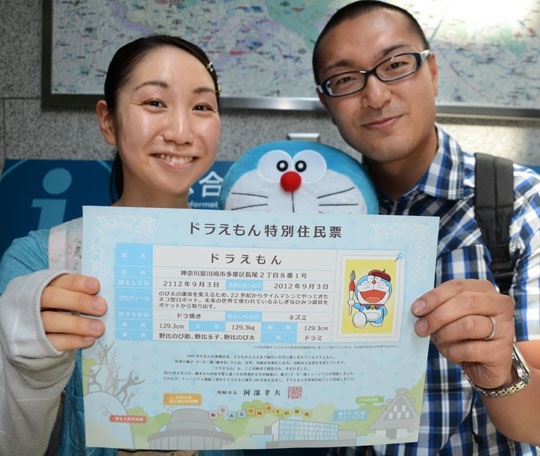 UPDATE 3 SEP 2112: On September 3rd 2012 Doraemon received an official residency certificate from Kawasaki city-100 years before his birth on September 3rd 2112. 2 sets of Doraemon stamps on sale in Japan. Doraemon toy in food store in Kappabashi-(Photo-© 2016 Louise Graber). UPDATE 19 APR 2017: On a trip to New York last month I found this Doraemon doll made up as Captain America in a shop window in Chinatown, along with a group of smaller Doraemons and a large Japanese neko. Archive of Australian Alternative Comics: GETTING SMASH(ed)! 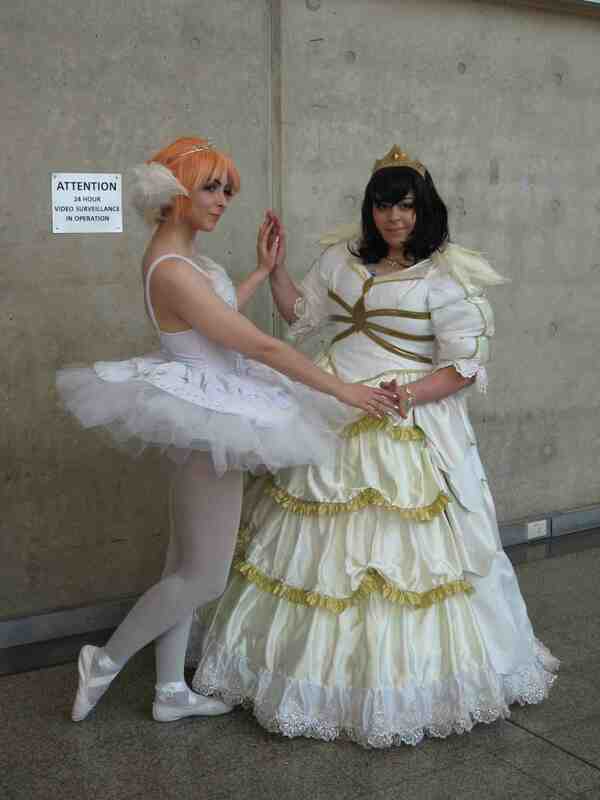 Saturday July 16 2011 was a day of anime amusement at SMASH! 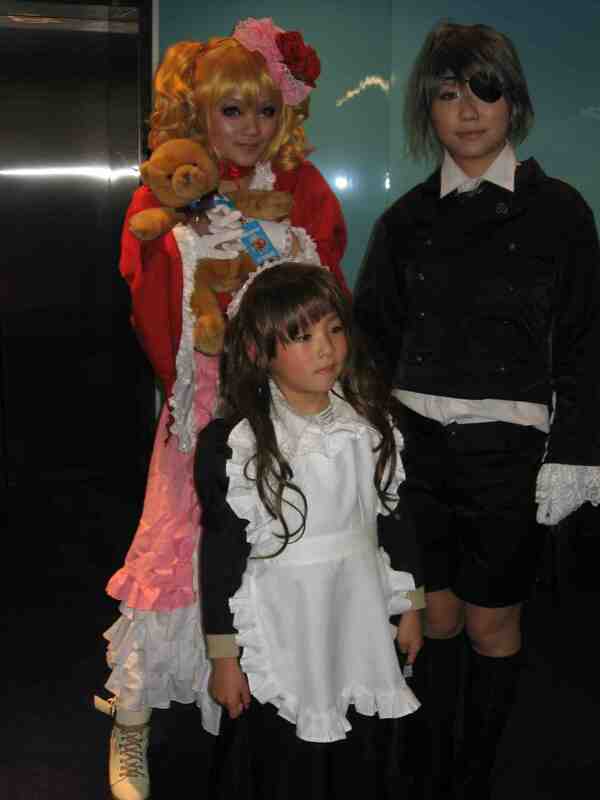 (the Sydney Manga and Anime Show). 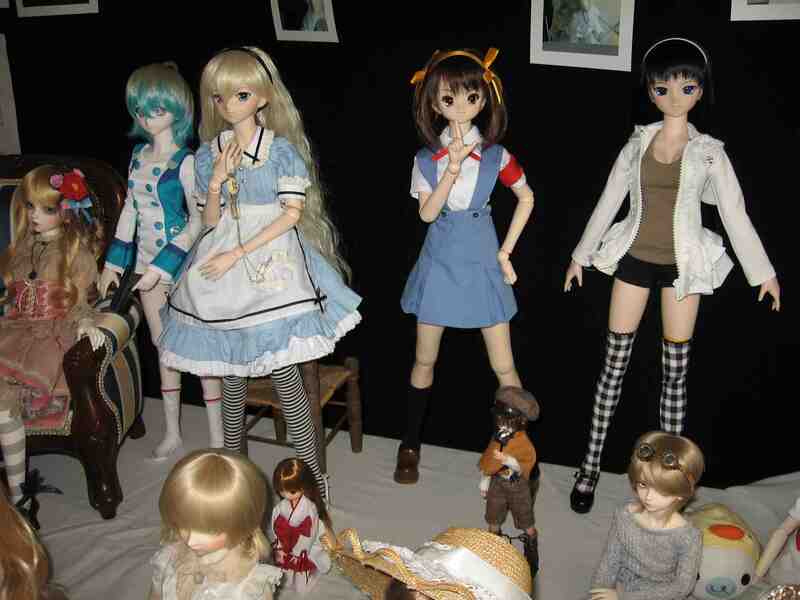 Over the past few years the local interest in manga and anime has grown and grown. Initially ignored by existing comics conventions fans created their own event. 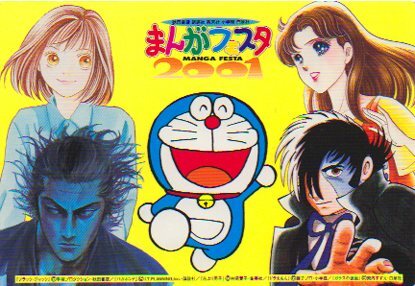 Some even began learning to read Japanese so that they could translate the manga. The conventions provided opportunities for fans to meet and enjoy these two media. Some local female creators began making their own versions of shōjo manga as a form of alternative comics and with local content. Interest continued to grow, as did the events. 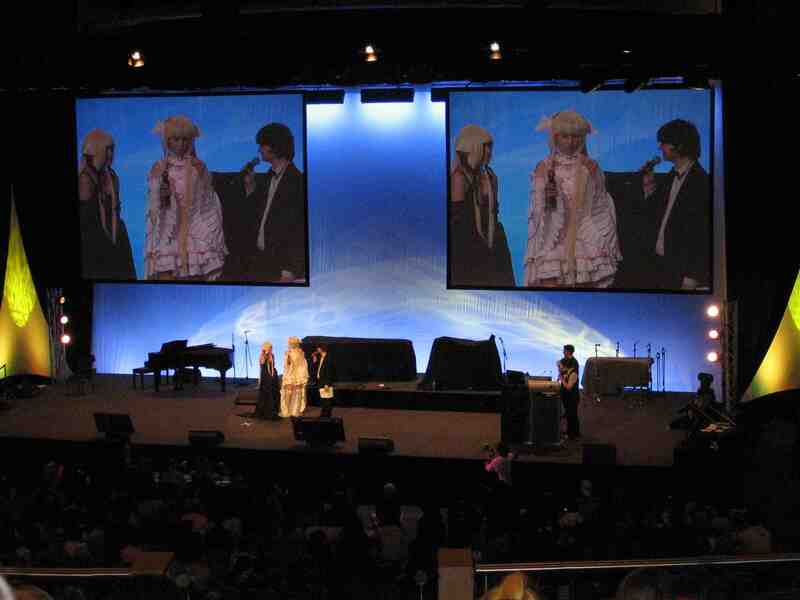 In Sydney there was Animania, in Melbourne, Manifest. And then there was SMASH! 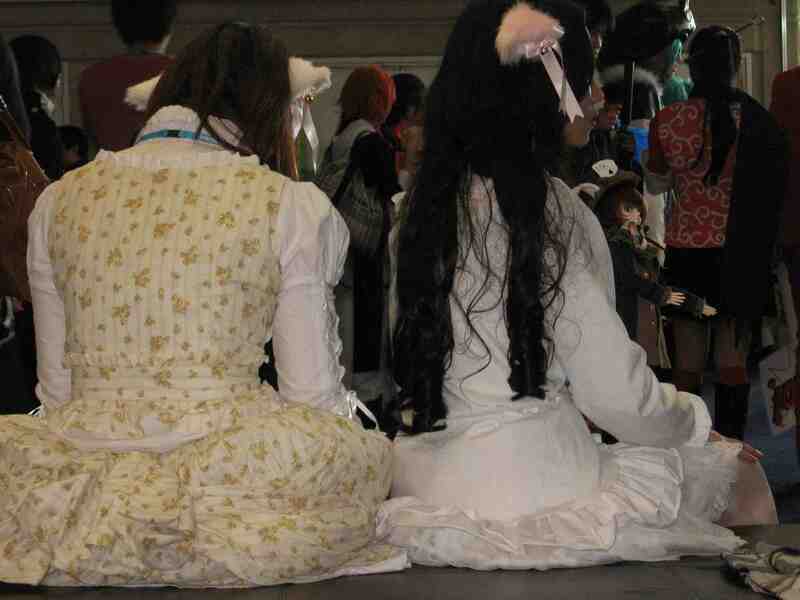 and tired doll collectors patiently waiting for a seat in the Maid Cafe. FOOTNOTE: I SAW A BIG SAW AT BIG SIGHT! 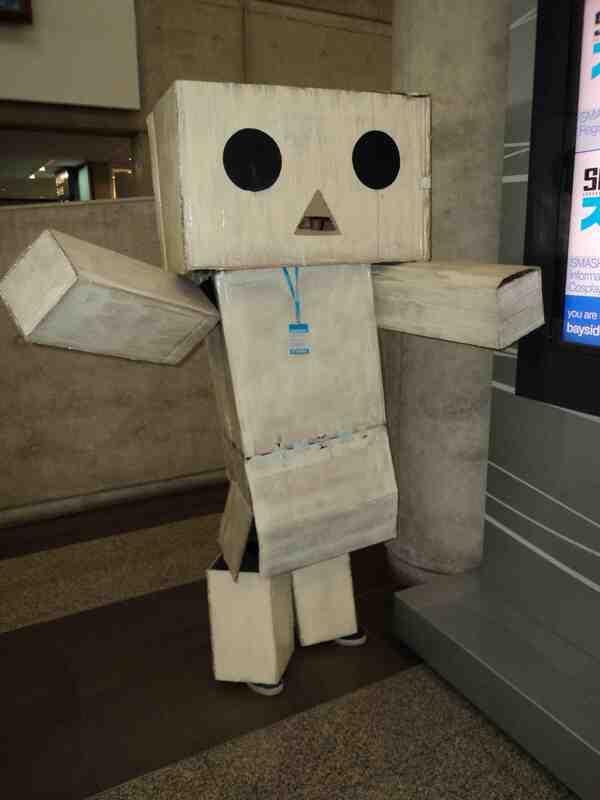 As an addendum to this convention report I must mention another I visited in Tokyo. 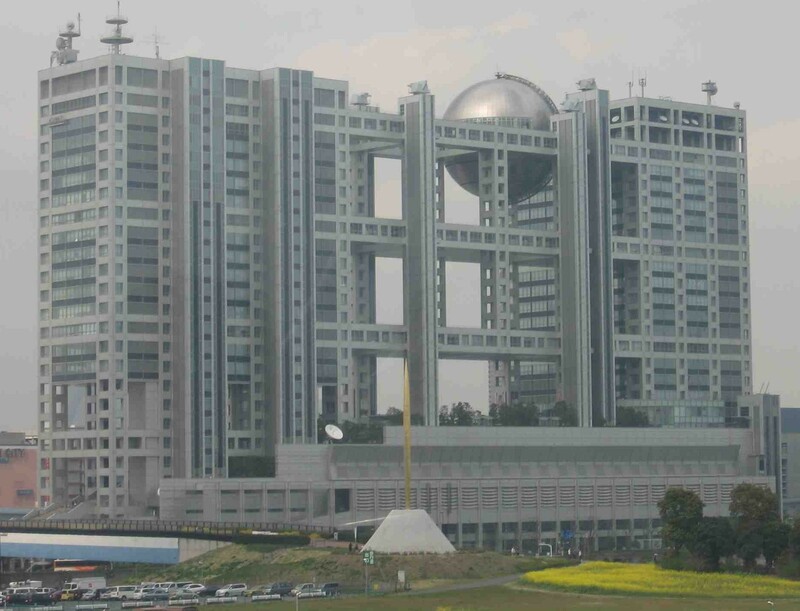 I travelled by monorail to Odaiba Island, an artificial island built in Tokyo Bay to attend the Tokyo Anime Fair at a venue called Tokyo Big Sight (pronounced Biggu Saito in Japanese). Big Sight? I thought that must be a misspelling along Japlish lines for the name of a large exhibition space. Shouldn’t it be called Big Site? However, as it turned out, there were definitely some big sights to behold. 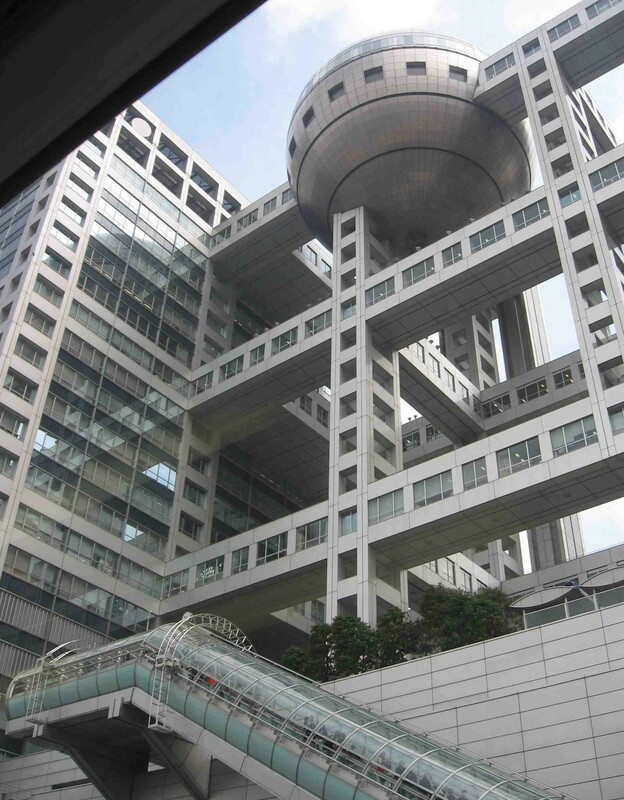 No sign of Godzilla but I thought of Thor as the monorail travelled over the Rainbow Bridge past some rather high tech looking buildings such as this one in the photo below of Fuji TV headquarters. Then on arrival at the Big Sight location things started to look a bit unusual. There was an open space beneath a series of inverted pyramids sitting on glass covered, cantilevered legs. This giant entrance had the effect of reducing the scale of the people passing beneath it and thus enhancing the ‘big’ aspect implied in the name of the site. 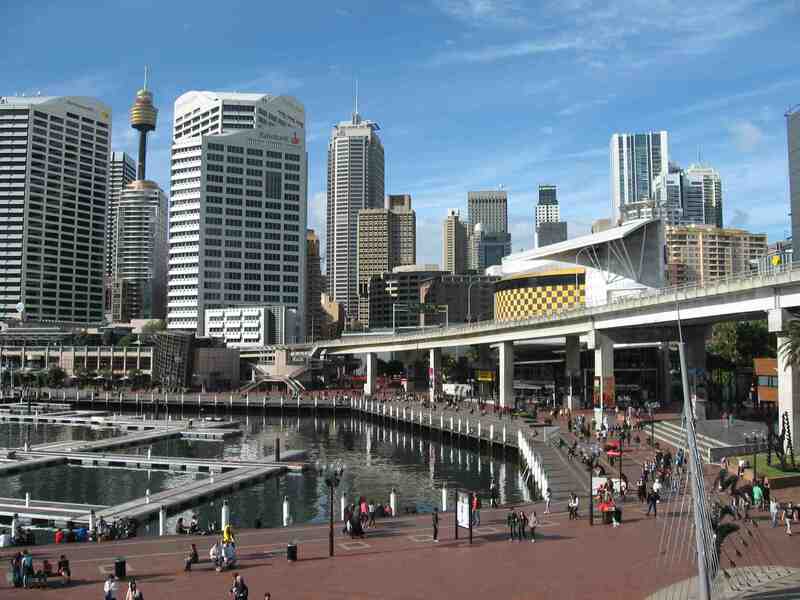 The walk from the monorail station to the entrance of the Big Sight exhibition centre has something of an epic feel to it. It’s there but it’s a long way over there and as one approaches, and that takes some time, the pyramids appear to grow in size and tower above one, providing something of a shrinking feeling as one nears. It was during this long walk that I happened to look over a railing, because I had drifted to one side of the open walkway, that I caught a glimpse of another large object embedded in the grass on the level below. 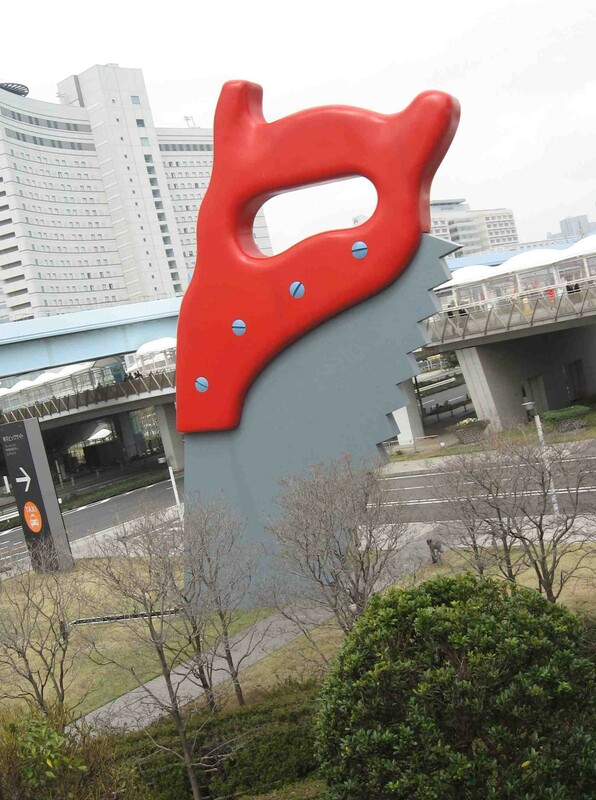 A sculpture…an art installation…a large saw…unmistakably something by the Pop artist Claes Oldenburg. It was a big sight to see at this big site. 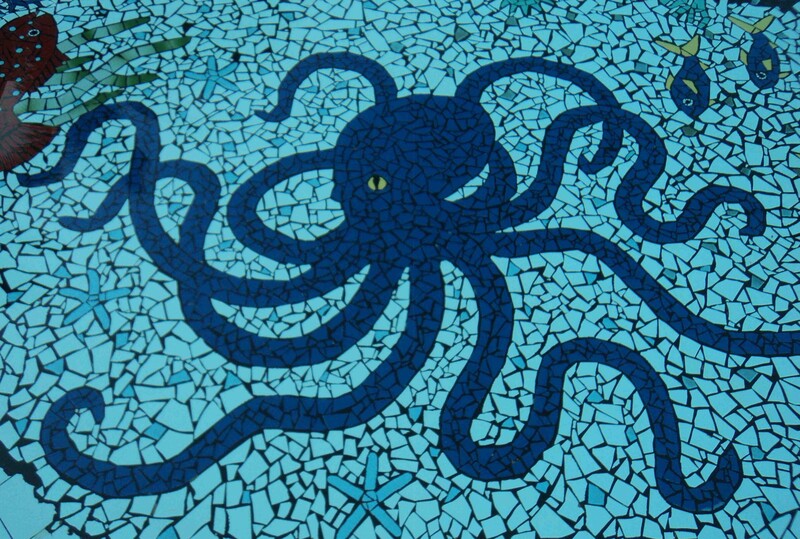 This BIG SIGHT post was first published on the Doctor Comictopus blog that has now been merged with this Doctor Comics blog. 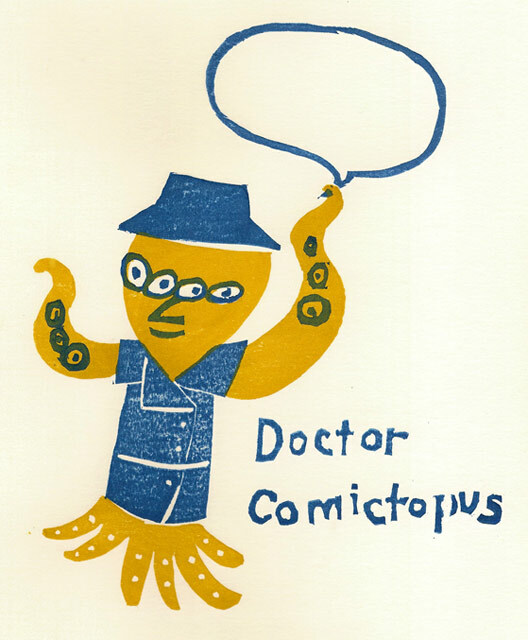 Doctor Comictopus alias for Michael Hill Ph.D. (a.k.a. Doctor Comics) designed by Michelle Park.